When Debbie Downing and her husband Jerry found a narrow storefront for rent in Old Colorado City, they had a chance to make a dream come true. And not just their own. “I was praying for this and along came Debbie,” says Tina Peters, a caterer who sells Mama Tina’s chutneys, cheese balls and more. Involved with marketing Jerry’s Gotta’ Love Garlic! gourmet garlic butter through farmers market as well as Debbie’s specialty cookies and cakes, the Downings knew many local food artisans still needed an outlet for their products when the farmers market closed for the season. As early as 1996, Debbie had wanted to start a food business, even sketching out ideas on paper. Now, with a storefront identified, the couple immediately began teaming up with other local food makers to create what they envision as a gourmet cooperative kitchen. 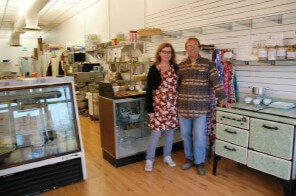 Carol Hildebrand subleases a bakery space in the back for her new business focusing on creative wedding cakes. She has done nearly 100 cakes since September. Many other small food artisans are entering into cooperative arrangements for prep space, retail space and co-marketing, including Mya Bella Cupcakes, Mountain Lightning Salsa and Wally’s Tamales. “This list will be ever-changing, as businesses grow and move on, and new ones come in,” Debbie says.